Why should you go with lasers over razors and wish away your wax? Stop worrying about the constant upkeep and start Enjoying the freedom of silky smooth skin all year-round. People have many different reasons why laser hair removal is the treatment suitable for them, this may be PCOS or the menopause – whereby hormone levels cause excess hair growth that can cause low self-esteem and embarrassment. Also, laser hair removal encourages the hair to grow straight, so it’s a great solution for ingrown hairs. Laser hair removal is a medical procedure that uses a laser to remove unwanted hair. Laser hair removal is a very effective and painless procedure for man and woman with any skin type and most effective who have light skin and dark hair. The process requires a series of treatments, but results can be seen after just the first time, proving how effective even just the initial treatment can be. With every treatment, you’ll progressively see fewer and fewer hairs return. Finishing the entire series of treatments is crucial, as that ensures that you see the highest degree of permanent hair reduction. ✅ No more shaving or waxing! Patch test required for Laser Hair Removal procedure. You are pregnant, suffer from vitiligo, diabetes, herpes, history of keloid scarring, lupus, excessively dry skin, hyperpigmentation, active eczema, psoriasis, skin cancer or epilepsy. Certain medications and herbal treatments which cause photosensitivity will also preclude you from having laser hair removal. You should make sure that the area to be treated is clean and shaved. It is vital that you do not remove any hair from the root in the run-up to your treatment, so no plucking, epilating or waxing. This is because the root is needed for the laser to do its job. Please note that you must thoroughly shave the area to be treated the evening before your appointment. Although laser hair removal effectively slows hair growth, it does guarantee permanent hair reduction up to 90% It typically takes multiple laser hair removal treatments to provide an extended hair-free period. Periodic maintenance treatments might be needed as well. Laser hair removal requires a series of treatments to be effective. There are no short cuts to this process. Each treatment removes a progressive percentage of the hair until ultimately the skin becomes smooth and hair free. Ideal Image accurately prices its treatment packages thru completion of the process, and beyond. You’ll be happy to know we offer the best treatment package in the country. 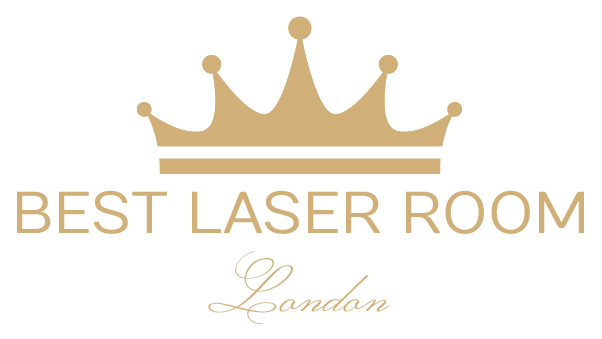 We recommend a free consultation to make sure we customize the right amount of treatments for each of our guests. We have several different payment options to fit your personal situation, which makes removing unwanted hair easy and affordable for EVERYONE! Light from the laser is delivered gently and safely to the root of the hair. 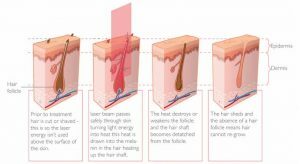 The root is heated to 45 degrees celcius which damages or destroys the base of the follicle and seals the capillaries so that it can no longer produce more hair. It does not damage the surrounding skin area and is totally pain-free. Is hair removal really painless? Is hair removal safe for dark skin? 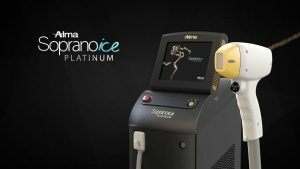 While the melanin in dark skin is exponentially more sensitive to the heat used in laser treatment, Soprano ICE’s SHR method has been clinically proven to be the safe for dark skin types. Rather than exposing the hair follicle to a single high energy pulse which can cause trauma to skin with a high melanin count, SHR gradually heats the skin until the required heat energy is delivered to the hair follicle. This makes SHR the safest laser hair removal option, including for dark skinned patients. While laser hair removal can be performed on virtually any skin colour and hair type, hair colour is the most important factor. The light emitted from the laser is attracted to the melanin, or dark pigment, in the hair follicle. This means that dark hair is treated most effectively. Treatments performed on red, blonde, and grey hair are not generally as effective. Our multiple laser modalities at each Ideal Image location, allow us great versatility for accommodating the wide variance in hair and skin colour. Depending on the patient’s skin and hair type, results are typically seen following minimum 6 to 8 treatment sessions.